Investors who bought during the last housing boom, before 2007, struggled as mortgage rates rose, with a sizeable number thrown a lifeline when the base rate was slashed to 0.5 per cent. Rates will rise again but due to the huge increase in renters and improved mortgage deals, investors are beginning to be tempted again. Are you a potential investor? 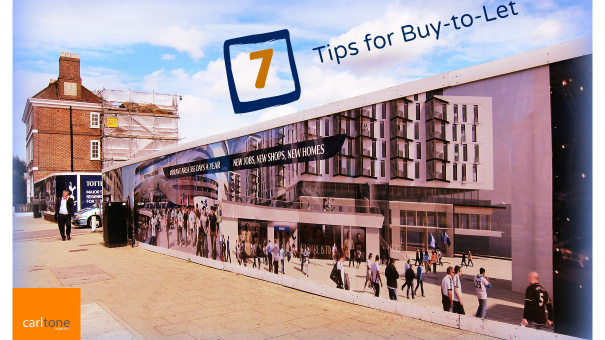 These seven tips are essential for successful buy-to-let investment. One of the most important things you can do before entering the investors market is research, which is likely what you are doing right now! For those new to buy-to-let, you need to ascertain if this type of investment is for you and what the process involves. Researching online and talking to someone in the industry can give you guidance and help you weigh up your options. Is the area popular with families? Or are there a lot of couples and young people? Or, maybe singles and students? Whatever the market, you need to find a home that suits at a price and location that is right for them. That’s why Carltone Property chose the Finchley Road Studios, for their close proximity to a cinema, shops and restaurants at the o2 Centre. A desirable area with the right home (think number of bedrooms and bathrooms) at a good price will fly out of your hands, both as a rental and to one day sell outright. When looking for an investment property, don’t fall into the trap of overpaying due to lack of experience. Make low offers and don’t be afraid of losing a property. A reasonable offer will be considered seriously and if not – there are plenty more fish in the sea! While your selling price will ultimately be the big one to win, your ongoing cash flow is also important. The rent you ask for should ideally more than cover the mortgage repayments to ensure it is servicing its own debt and covers for any rising interest rates or unexpected fees. Not having insurance can have serious consequences, making it essential you and your investment are protected. Landlord insurance is a growing area, with an increasing number of specialist policies covering everything from standard building and contents risks to loss of rent, heating and other appliances. This was mentioned briefly previously, but for first time investors, professional help is like gold. They can offer advice, guide you in the right direction and even use their network to ensure you get the best deal and ROI. Buy-to-let can be a lucrative investment opportunity. For more tips or to see if this is right for you, have a chat with a representative at Carltone, one of the best high quality residential and commercial property developers in Central and North London. Call on 020 7935 7125 or enquire through our website now.